Rivka Eilfort is an 18-year-old Chassidic singer/songwriter whose parents are Rabbi Yeruchem and Nechama Eilfort of Chabad at La Costa. The former Chabad Hebrew Academy student sings deep, mystical lyrics while playing guitar in rhythm to a beautiful folksy tune like a natural star. Rivka says she wants to study music and pursue a professional music career. She dreams of performing concerts for Jewish girls and recording CDs. Until now, opportunities were scarce for Orthodox female artists who adhere to laws of modesty and do not perform in front of men. A new groundbreaking program, called Tzohar Seminary for Chassidus and the Arts, opened its doors last September in Pittsburgh, Penn., for a group of 11 talented young women who are singing its praises — or dancing, painting, writing, performing and filming. 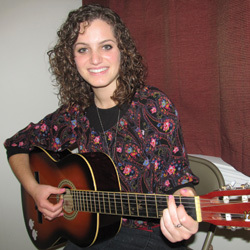 Rivka, one of the 11 in this inaugural class, is now studying in the traditional Judaic track after high school but also developing her passion for music. She is already learning new skills at Tzohar to help her along the way — reading music, videography (to create music videos), music theory and voice lessons by a professional opera singer. Tzohar marks the first time a seminary is integrating Chassidus, also known as mysticsm — the deeper, inner dimensions of Torah learning — with the creative arts so that the two play off of one another. The name, explains founder and director Amy Gordon Guterson on the Web site, refers to a window that let light into Noah’s ark, and also a precious stone that emitted light. By offering courses comparable to those in secular university fine arts programs, like writing, music, dance, fine arts, theatre and filmmaking, as well as Chassidus courses taught by notable teachers, students are developing their skills in a creative yet sacred environment. Many Chassidic women don’t attend university because the secular influences are not in line with their lifestyles. Here they can have the best of both worlds. Guterson, a Pittsburgh artist herself, studied theatre at Stern College for Women in New York, then earned her graduate degree in acting from The New Actors Workshop. She studied with acclaimed actress Uta Hagen and respected director Mike Nichols and was a member of Actor’s Equity who performed Off-Broadway. Her journey led her from the secular theater world, where she was an actress, to the Jewish community in Pittsburgh, where she became involved in creative community projects. In the past, Guterson struggled with what she saw as a restriction for frum and female artists — not only couldn’t she grace the stage on Shabbat, but she was restricted in performing for a general mixed audience. “The limitations of not being able to act in the theater world on Shabbat made me create my own opportunities and become a writer, director and producer as well,” Guterson says. Among her achievements was creating the award-winning festival film, “Becoming Rachel,” and leading a women’s theater group in her community called “Kol Isha,” which created original productions based on issues of Jewish womanhood and Jewish unity. Guterson believes her seminary is filling the need to create venues for religious female artists. Her past journey was a motivating factor in opening the school, as was her consideration of her own musical daughter’s future. 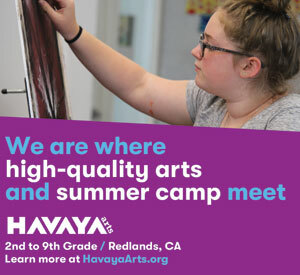 In addition to plays, videos and artistic projects her students share with the community, they also teach after school arts at the Jewish day schools and teach Judasim through the arts in local Hebrew schools. 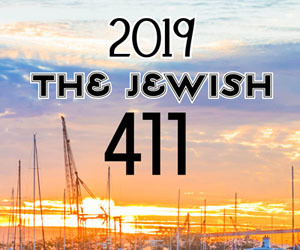 It’s also helping to connect the community of Pittsburgh, which serves as a focal point for many local artists and writers now practicing Judaism. There’s an impressive array of faculty with artistic and academic backgrounds who serve as mentors and teachers to its students, some in the Jewish learning arena and others as hands-on artists. Guterson pooled teachers from nearby, such as Leibel Cohen, creator of the popular “Agent Emes” DVD series for Jewish children, who is teaching filmmaking, and Shais Taub, worldwide lecturer and author of the successful teaching tool “The Map of Tanya” and “Soul Maps,” who is teaching a course called “Chassidus and Creativity.” Leah-Perl Shollar, an educator and published author, is teaching creative writing with Jewish sources. Guterson sees her role as “nurturing students’ talents” and is teaching theater and the class “Creativity and the Arts,” where students spend time in the morning before prayers for self-exploration through writing. Second semester, they focus on Jewish women and build a Story Theatre Production of Biblical women; third semester they explore their purpose according to Chassidus: Bringing light into the world. “The Creative process is a Godly one,” Guterson says. She wants her students to integrate learning, creativity and life with Chassidus and the other Judaic classes offered, such as Jewish Law, Tanya, Chumash, Jewish History and Talks of the Lubavitcher Rebbes. The school’s principal is Rabbi Aaron Herman, known for his teaching skills and developing curricula, including JLI courses. After spending 13 years as Chabad rabbi in Raleigh, N.C., Rabbi Herman returned to his hometown of Pittsburgh as Tzohar was getting started. For example, Rabbi Herman says students can “take something dry and make it alive” by acting out a case discussed in Jewish law. 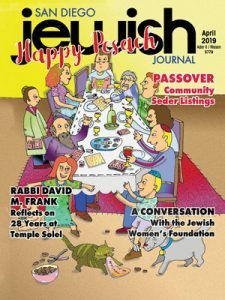 Rochel Goldsmith, a student at Tzohar who grew up in Iowa, decided to attend the seminary because her mother is an artist, and she grew up in an artistic home. Wanting to pursue a career in the arts, Goldsmith originally planned to attend Pratt Institute and then heard about Tzohar. Goldsmith’s mother, Shoshana Goldsmith, says she wanted to send her daughter to a seminary where she could develop her artistic talents and also nurture her spiritual growth; Tzohar was the only such place. Over the past few years there has been an emerging community of frum female artists, especially in the world of film and theater. Many of them belong to ATARA — the Arts and Torah Association for Religious Artists — founded four years ago by Miriam Leah Droz, a frum actress originally from Pittsburgh who now lives in New York. Through emails and listserves, the organization connects religious artistic women and provides opportunities, event listings and an annual convention in New York packed with classes, workshops and performances with women from around the U.S.
Guterson is a board member for ATARA and has taught master acting and play development classes at its conferences. She plans to take her students on a trip to the three-day event, held this coming March in New York, where they’ll experience other frum women in performance and media arts. Witnessing Guterson’s success with many projects for their school, she admired Guterson’s new concept for the arts seminary. For more information, visit www.tzoharseminary.com or call (412) 521-1197.